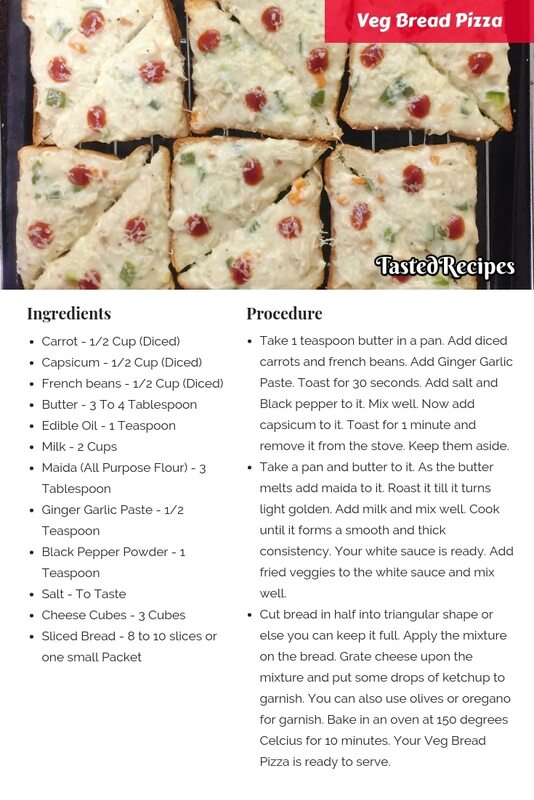 Veg Bread Pizza is a quick and easy snack recipe made with bread, white sauce and veggies of your choice. Just a few ingredients and gets ready in no time. The end results get meltier and crisper than the kids of the house will totally fall in love. What is Veg Bread Pizza? 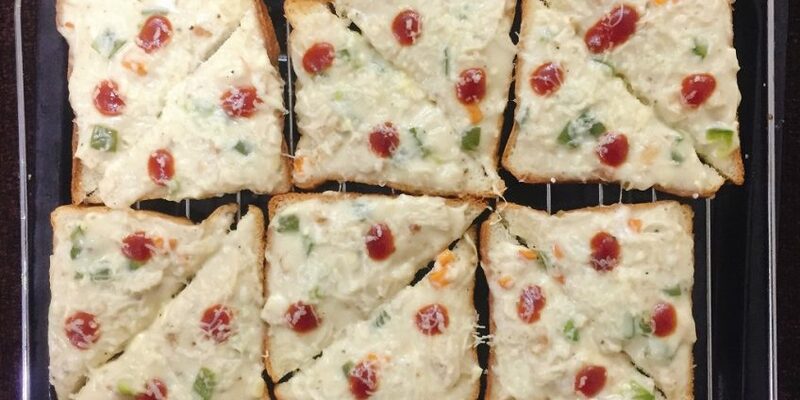 Veg bread pizza is a dish for the people who are a little lazy to cook. 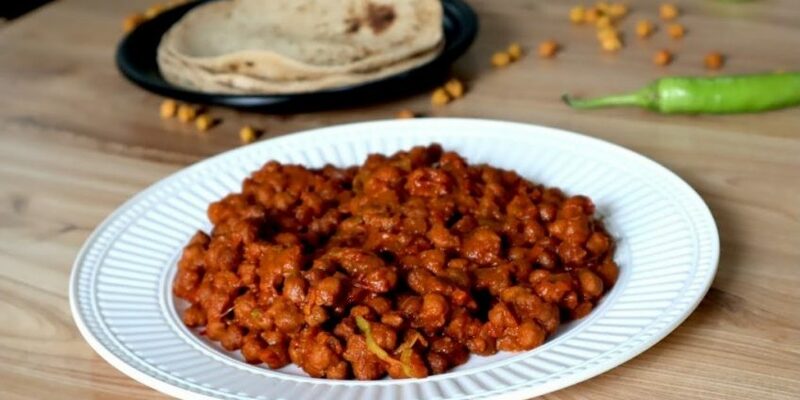 It is a recipe of few ingredients & more taste. You just have to follow three simple steps and the amazing looking pizza is ready. Generally, the Pizza trend is with sauces and pizza dough. But here it’s only bread & cheese and some veggies. No stress, no expert cooking style. It is a comfort pizza party at home. The veggies for the bread pizza are toasted in butter then mixed with the white sauce made with maida, milk, and butter will rejuvenate your taste buds. Is Bread Pizza a fusion recipe? Yes, totally. Veg bread pizza is a different style of cooking than normal pizza. It is one of the nicest version of pizza. You don’t need a microwave to make pizza now. 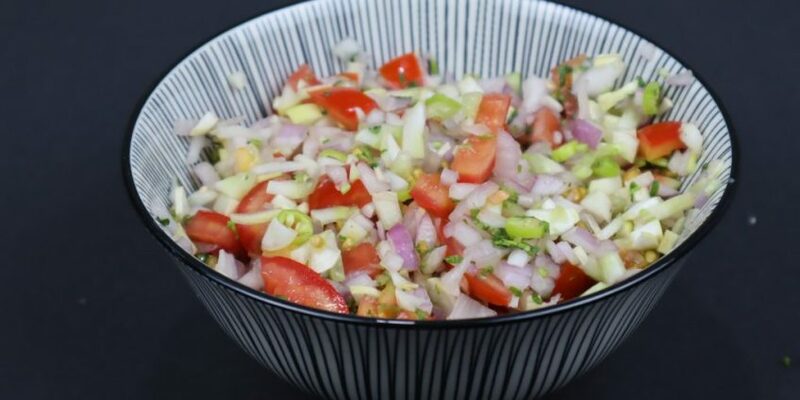 Can we make Veg Bread Pizza on Tawa? Good news. You can make veg bread pizza on tawa. You just need to prepare the bread pizza and put it into the pan and cover it with the lid until the cheese melts and the base gets crisper. 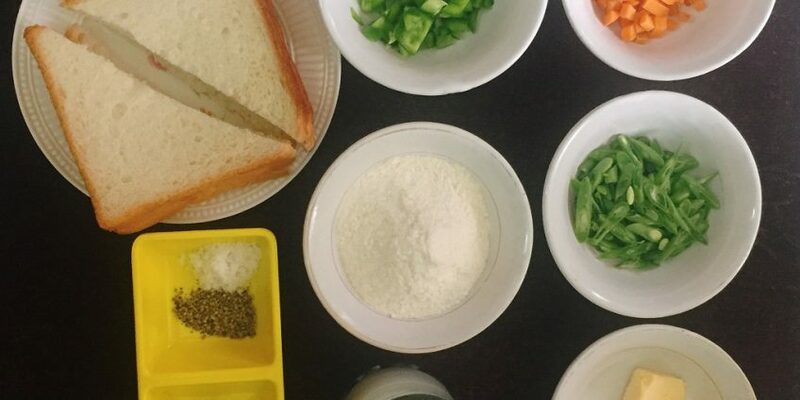 How to serve Veg Bread Pizza? Serve it on any black colour platter to make it look attractive or any wood base. What things to use for garnishing? You can always go for various kinds of toppings like black olives & mushrooms. If you don’t have time to prepare the pizza dough and want to make some delicious food in no time this recipe is a great choice. Often it happens that we have some important and sudden guest. At these time we get into dilemma what could get ready just like that and also have a good taste and impress your guest. Veg Bread Pizza is the best choice in such situations. I call it a lazy cook’s food. When not in a mood to cook the traditional dishes and just fill the tummy with some yummy food Veg Bread Pizza can be a perfect choice. 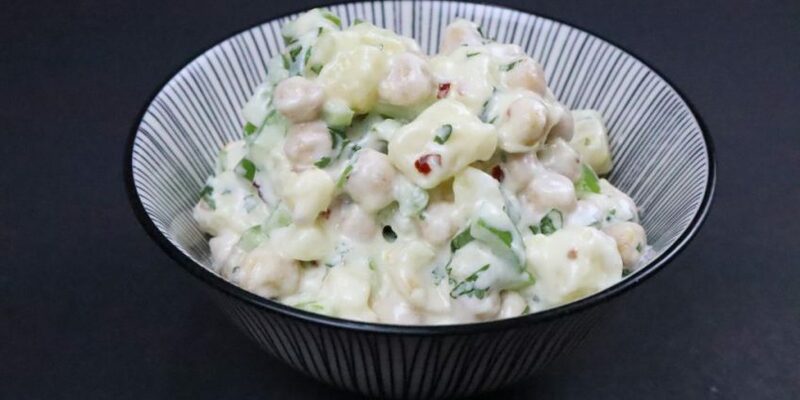 The best thing about this recipe is that it is a kid’s favourite. You can choose the veggies of your choice and also the toppings. I have kept them simple with not toppings. You can use either olives or oregano over the Bread Pizza. Take 1 teaspoon butter in a pan. Add diced carrots and french beans. Add Ginger Garlic Paste. Toast for 30 seconds. Add salt and Black pepper to it. Mix well. Now add capsicum to it. Toast for 1 minute and remove it from the stove. Keep them aside. Take a pan and butter to it. As the butter melts add maida to it. Roast it till it turns light golden. Add milk and mix well. Cook until it forms a smooth and thick consistency. Your white sauce is ready. Add fried veggies to the white sauce and mix well. Tip: The measurement here is given according to what we needed. Milk from different companies differs in fat content. Thus, you can add if required. Cut bread in half into triangular shape or else you can keep it full. Apply the mixture on the bread. Grate cheese upon the mixture and put some drops of ketchup to garnish. You can also use olives or oregano for garnish. Bake in an oven at 150 degrees Celcius for 10 minutes. Your Veg Bread Pizza is ready to serve.